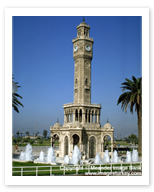 Given to the city of Izmir by Sultan Abdul Hamit II in 1901, this ornate clock tower will be hard to miss once you arrive- not only because of its central location near the Governor’s Mansion, but because it has become the official symbol of the city. You should vistit the Clock Tower- it’s worth a look. Besides, you couldn’t avoid it even if you wanted to.